A Foam Roofing system will need maintenance and repair but is much easier than built-up or singly ply rooftops which need to be removed and replaced completely. We can easily repair and recoat your foam roofing to last indefinitely. One thing you should not do, is try to repair or recoat a foam roof yourself as unskilled repair attempts can result in new leaks causing additional problems with your roof. Call us to inspect your foam roofing system and we can determine if repairs are needed. When installing a foam roofing system, it is best to hire a professional company that understands the correct process from start to finish. 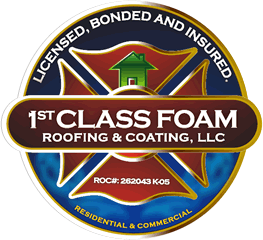 At 1st Class Foam Roofing and Coating, we are knowledgeable with the technique of safely and properly installing a foam roof as well as building code requirements. Trust our experience for your foam roofing system. "The crew were polite and worked long hours to complete the job! " Seamless - Seams are one of the major reasons of why a roof leaks and foam roofing systems do not have any seams. Light weight - Instead of having to remove an old roof in order to apply a new one, minimal tear off is needed on foam roofing systems. Sustainable - Maintenance is very minimal with a foam roofing system and has an indefinite lifespan. Lower cooling costs - The protective barrier on a foam roof is highly reflective which cools your roof and greatly lowers air conditioning costs. Soundproofing - A foam roof provides superior insulation and is effective at reducing sound transmission giving you a quieter building. Quick Installation - The application of a foam roofing system is very quick and can sometimes be accomplished in one day depending on the size of the job.